That’s what I told myself when I signed up for the one day visualization training “Faszinieren am Flipchart”. 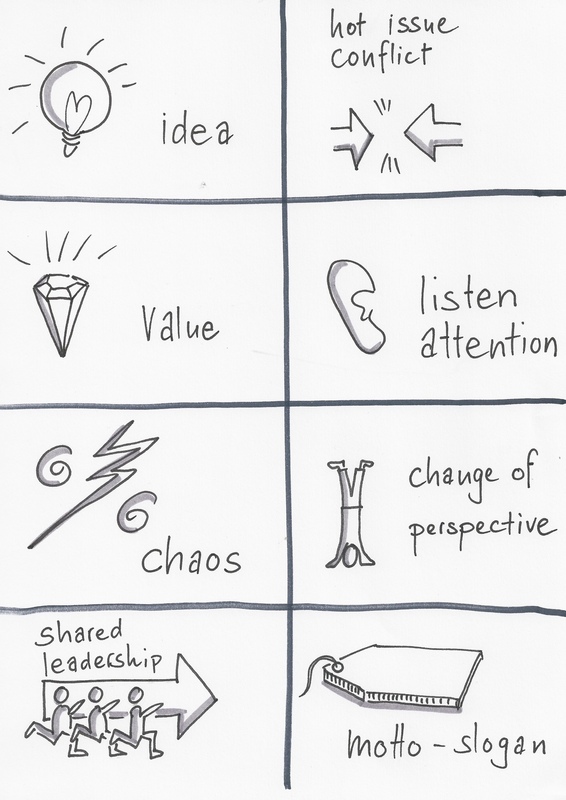 I want to get better in drawing and visual note taking. Because drawing while meeting is fun and helps to capture the essential. Sketching helps me think. And it is useful for groups too; I experienced more often that grabbing (spontaneously) a pen and starting to visualize an issue supports joint understanding. 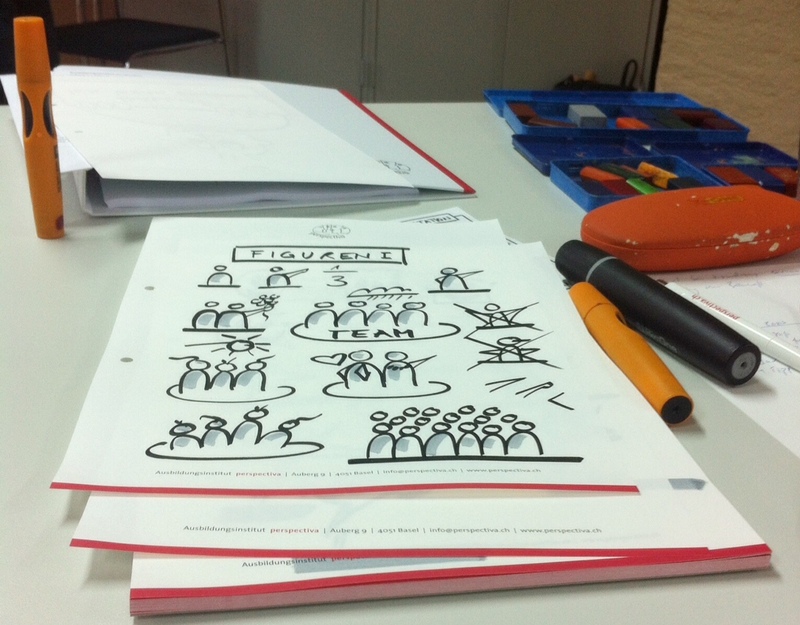 The training “Faszinieren am Flipchart” with Cornelia Kauhs was playful and inspiring. We produced many flipcharts. And Cornelia convinced me that all it needs to become a drawer is practice and some tricks. One of the first points Cornelia insisted on was the material: have your own board markers to be on the safe side, as the ones you find in the meeting room are too often too weak, and keep your posters simple and clear by using 2-3 colors: black as basic, grey for shade and one color to highlight; add wax crayons or pastel to make posters stronger. I restarted drawing about two years ago. In the meantime I dare to doodle openly, with simple stick figures I manage quite well. But I must admit that the end product looks rather messy, understandable to the people involved, but often not shareable with a wider audience. I like the canvas Design for Action. I can draw it before the meeting. To get more organized in my doodling and my drawing I will think more ahead of a meeting how I could visualize smartly. Zeichnen? Man muss gut kopieren können. I searched for an easy icon for ‘change of perspective’. After several trials I came up with the stick figure making a headstand. I was pleased, this one I will keep in mind. And here some more of my newly developed vocabulary. Biklabo: These books are just an endless treasure. And as always Nancy White sharing generously her resources: Visual Work and Thinking. A Google search for drawings, icons or cartoons is always helpful. 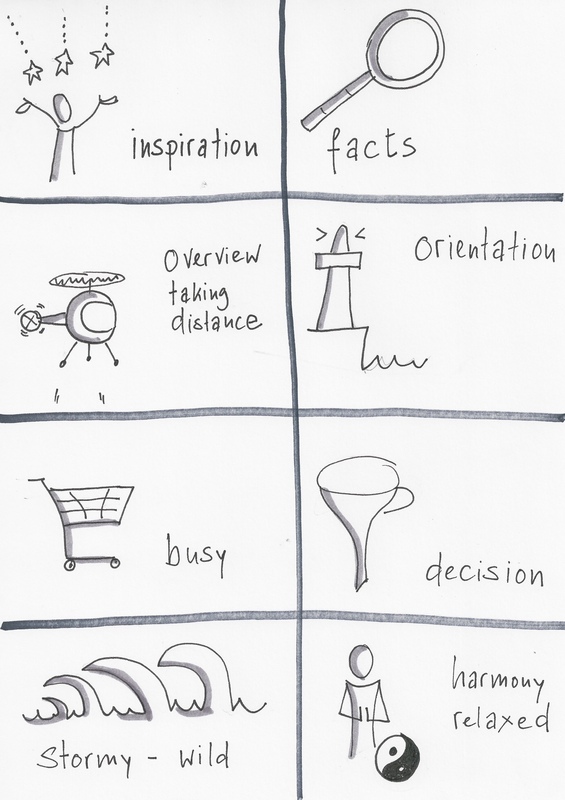 When I know how to draw certain key words or concepts; not only does it get easier, I also become faster. A stock of icons I frequently use allows me to draw more complex posters or even stories. And this is really something that interests me. And now: practice – practice – practice. How do you draw ‘change of perspective’ ? What are your favorite icons? And there is even an App!